Losing your keys can be one of the most frustrating things that a person to do. Despite the level of frustration that a lost key can cause, people lose their keys on a daily basis. 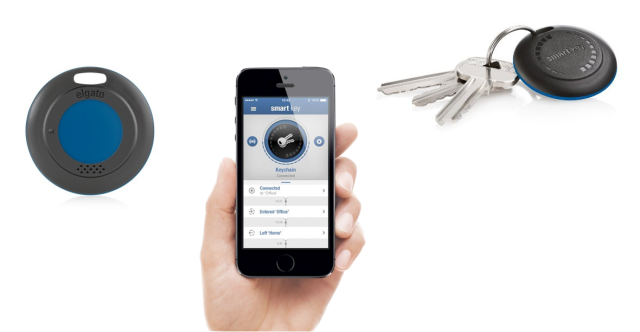 Fortunately, the Elgato Smart Key can prevent the loss of your keys. Elgato Smart Key works by connecting your keychain to your iPhone. By connecting your keychain to your Apple device, whenever your key is left behind, your iPhone will send you a notification. If you are unable to find your key, you iPhone will help you locate it by playing a sound. It also has the ability to remember the last place your keychain was. You can plan how, when and where to find your key if it is ever lost. It’s quick and simple to download the accompanying app, which you can personalize to fit your specific needs. Elgato Smart Key is compatible with all iPhones that are 4S and newer, and it also works with various models of iPads, as well. There is no need to worry about replacing batteries on a frequent basis, as the battery that provides its power in a low energy manner via the Blue Tooth technology only requires replacement about every 6 months. If you purchase more than one Smart Key, you have the ability to use them to help you locate your vehicle in cases where it has been parked for several days. It can also be used to alert you of when your luggage has arrived when traveling. The box contains one Elgato Smart Key, a key ring and a quick start guide. With this new technologically-advanced device, you will never have to worry about replacing keys again, which can be costly, as the Smart Key will be there to assist you.